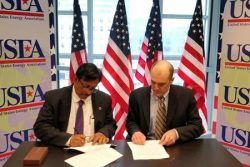 Chart Industries, Inc., a leading diversified global manufacturer of highly engineered equipment for the industrial gas and energy industries, and Indian Oil Corporation Limited (IOCL) signed a Memorandum of Understanding (MOU) on March 18, 2019 to promote the development of the LNG Market in India. Applications include refueling infrastructure for road, rail and water -based transportation. Chart and IOCL have entered into this MOU based on complementary synergies and mutually beneficial business objectives arising from the demand growth of natural gas in India. Working together, both parties will explore opportunities for cooperation to promote natural gas and LNG development in multiple industrial and commercial sectors. “The LNG opportunity in India is significant, as evidenced by the government’s commitment for clean fuel, and the double-digit LNG growth forecasts. We are excited about working with IOCL as it expands our reach into the LNG market in India, and provides IOCL with speed to market as well as expanded service access,” said Jill Evanko, Chart’s President and CEO. “This opportunity originated from the recent acquisition of the VRV businesses now within our portfolio of offerings”. Chart Industries, Inc. is a leading independent global manufacturer of highly engineered equipment servicing multiple market applications in Energy and Industrial Gas. Our unique product portfolio is used throughout the liquid gas supply chain in the production, storage, distribution and end-use of atmospheric, hydrocarbon, and industrial gases. Chart has domestic operations located across the United States and an international presence in Asia, Australia, Europe and Latin America. To learn more, visit www.Chartindustries.com. Chart Industries (www.chartindustries.com) is a corporate member of NGV Global.